HP ProLiant servers support multiple means of booting, including PXE and using Virtual Media through the Integrated Lights-Out controller. DHCP is recommended to use in the server operating system deployment environment. HP is currently diagnosing the issue of static assigned network IP address. Open the Configuration Manager Console, and navigate to Site Database>Computer Management>Operating System Deployment>Task Sequences. 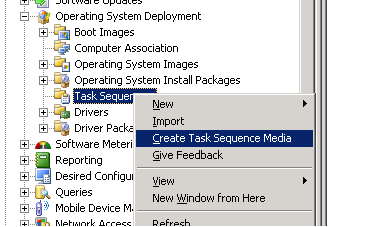 Right-click Task Sequences and select Create Task Sequence Media to start the Task Sequence Media Wizard. 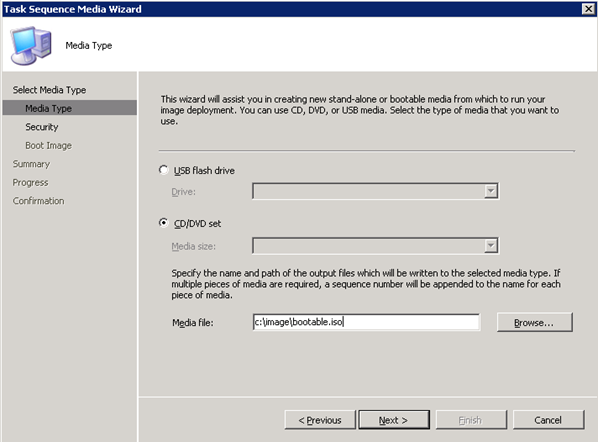 To create a WinPE ISO image to use with Virtual Media, select Bootable media. Click Next. Specify the Media file, such as C:\image\bootable.iso. Click Next. Enter the password to protect the media, or clear the Protect media with a password checkbox. Click Next. Click Browse, expand the HP ProLiant Server OS Deployment folder, and then select either the HP ProLiant Server OSD SSTK 22 Boot Image (x86) or HP ProLiant Server OSD SSTK 22 Boot Image (x64) boot image. Click OK, and then click Next. To begin media creation, click Next. To complete the wizard, click Finish. Open HP iLO web interface, and then log in. Boot the ProLiant server, and then press F9 to go into the RBSU. Copy the MAC address of the NIC that is connected to the Configuration Manager's network. Open Configuration Manager Console, and navigate to Site Database>Computer Management>Operating System Deployment>Computer Association. 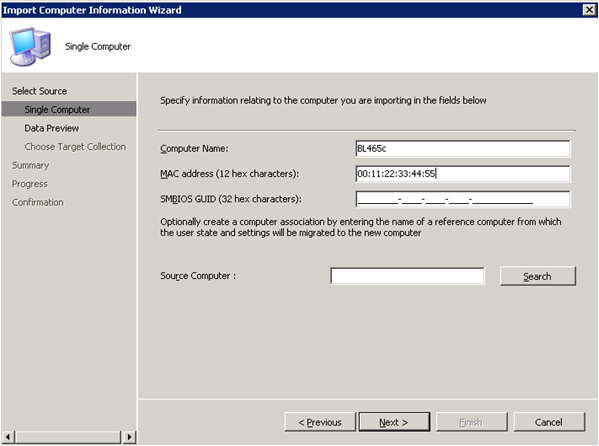 Right-click Computer Association and select Import Computer Information to open the Import Computer Information Wizard. Select Import Single Computer, and then click Next. Specify the computer name, enter the previously copied MAC address, and then click Next. Select the appropriate collection membership option and click Next>Next, then to complete the wizard to register the new MAC address click Close. NOTE: For this example test, HP recommends that you create a new empty collection for this computer. Advertise the HP ProLiant Server OS Deployment task sequence, as described in Using the Software (Chapter 4 “Using the software”). 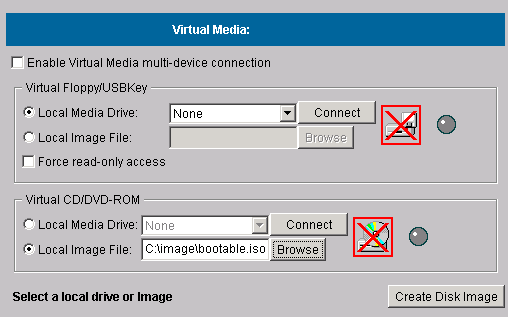 Open the iLO Virtual Media applet, click Browse, and then select the previously saved bootable media image. Without closing the Virtual Media applet, boot the ProLiant server, and direct the system to boot to CD. This action boots the WinPE image created in the previous steps and performs the advertised Task Sequence. You can press F8 to open a command after WinPE completes the initialization process to diagnose any network and storage issues. Many ProLiant servers are shipped with PXE-capable network interface controllers. For proper configuration of Windows® Deployment Server and the Configuration Manager PXE Service Point component, see the Configuration Manager documentation. After you have set up the PXE boot infrastructure, to enable ProLiant servers for PXE boot-based deployment using Configuration Manager, perform the following steps. NOTE: System Center Configuration Manager 2007 R2 supports operating system deployment through the All Unknown Computers collection. This feature enables you to advertise and run task sequence on new PXE booted servers without requiring you to enter machine-specific information. To go into the RBSU, boot the ProLiant server, and then press F9. Enable PXE boot on the NIC connected to the network where Configuration Manager connects through PXE. Copy the MAC address of the PXE-enabled NIC. Open Configuration Manager Console, and then navigate to Site Database>Computer Management>Operating System Deployment>Computer Association. Right-click Computer Association, and select Import Computer Information to open the Import Computer Information Wizard. Select the appropriate collection membership option and click Next>Next, then click Close to complete the wizard to register the new MAC address.